Dance this Summer! Ballet Buffalo offers Storybook Dance Camps, Ballet Intensives and Musical Theater camps! 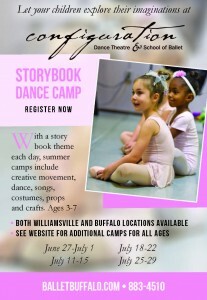 A fantasy land of pure imagination awaits your child this Summer in Western New York’s original Storybook Dance Camp. Click here for more information. Many positive benefits to children are associated with learning the art of ballet. Click here for more information. For more information please call on 716 883 4510 (Lexington) or 716 204 8192.